Stabirails method for slab track construction offers many advantages when laying slab track, especially in hard to reach places like in tunnels and on railroad bridges. Slab track offers countless advantages compared to its traditional counterpart. For example reduced vibration to surroundings, shallower construction height, low maintenance costs and a long design life. Stabirail designed and developed a new and ground-breaking technique for “bottom up” slab track construction. In contrast to traditional “top down” slab track construction methods, the rails can be attached directly to the concrete bedding, which allows for faster construction times and higher accuracy. Our new technique for laying slab track is especially effective in tunnels and on railroad bridges. Looking for a trustworthy and punctual partner for you slab track construction project? Look no further! 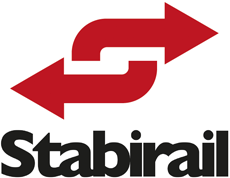 Stabirail brings the necessary know-how and experience to the table to complete any slab track construction project with ease. If you are looking to carry out the works yourself, but still want to use our equipment and tested and proven method, we can rent out the necessary machines and provide an extensive training for your personnel. Stabirail’s equipment for laying slab track consists of three machines working consecutively that can be rented out as a whole or separately. For slab track construction projects that exceed regular size or duration, we also provide the option to buy one or more of our machines. Extensive training for your personnel will be provided. Stabirails extensive experience allows us to provide you with a detailed analysis of your project. We will provide you with the most cost-effective and time-consuming options to complete every slab track construction project with ease.